Despite the fact that this event was promoted primarily through a social network site, and despite the fact that I’m supposedly “into” that sort of thing, I didn’t know anything about the Krewe of Dead Pelicans until we read the paper Saturday morning. We were planning to head to Julia Street that evening anyhow for a friend’s opening, so we decided to check it out. I didn’t think we would actually participate, silly me, until Xy and Persephone came downstairs dressed in the suggested outfits: blue shirts, black pants, boots. 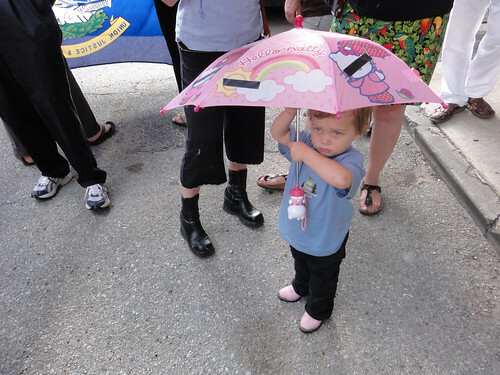 Xy gave Persephone’s Hello Kitty umbrella a special treatment and I grabbed by Geuxjira shrimper boots and we set off. I think Persephone’s expression in this photo captured the mood perfectly: sad but determined. As you might expect for a second line in the arts district, there were some spectacular costumes that made powerful visual statements. I can’t take credit for that shot. It’s by the indefatigable Infrogmation. Check out the complete set. I wasn’t able to snap too many photos because I was too busy looking after a certain toddler who couldn’t quite keep up with the parade. I’d scoop her up and hurry forward, but not for long, because she demanded to be put down. She didn’t want to be carried, she wanted to march. Seriously, she took to this like it was in her blood. 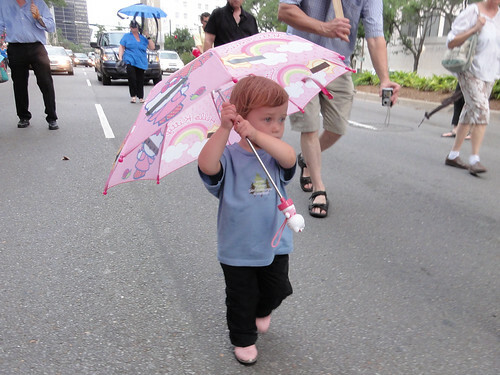 She would not put that umbrella down, and she marched pretty much the whole way. I was very impressed. Midway, we stopped to observe eleven minutes of silence for the eleven worker who were killed when the Deepwater Horizon blew. It was the first time I’d heard their names. I thought it was an appropriate observance, and one that resonated with me as I’ve been thinking a lot about the value of silence and stillness lately. At about the five minute mark, Persephone asked me what happened to the music? She wanted to hear the band play. She wanted to second line. 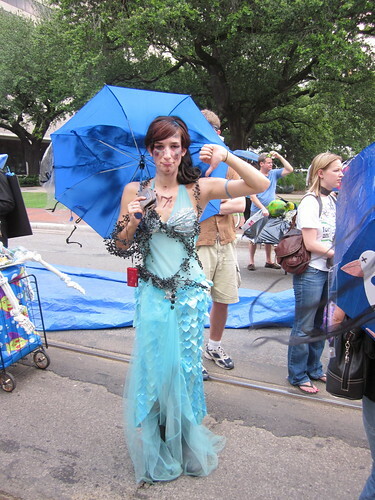 It’s almost as if she’s a native New Orleanian. being inspried by kid’s untainted emotions and attitudes is a great way to get through this mess on a day-to-day basis….. Mom caught my little joke.